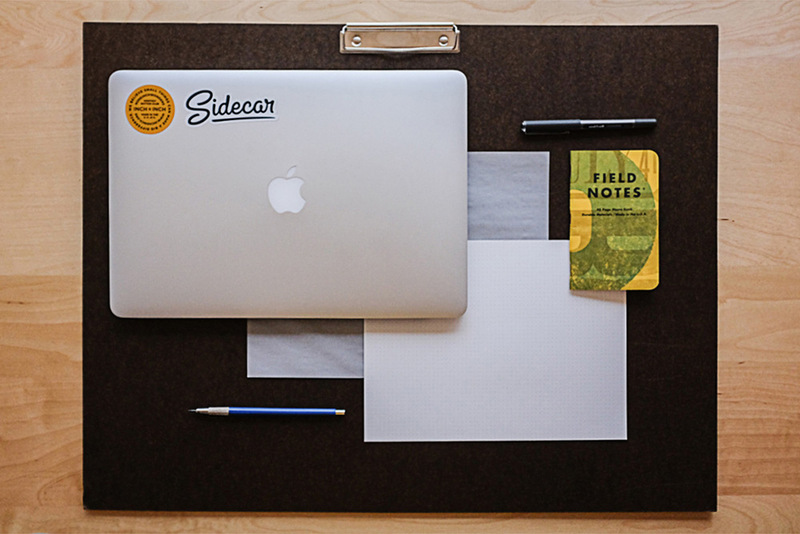 Setting up a productive workspace is no easy task. Maybe you have a desk where you do your creative work, but you still get distracted all the time and don't getting as much done as you want to. If you want to make your space more efficient for freelance & personal work, you'll love this post. I asked a few of my most talented friends, lettering artists, and creative freelancers to bring me behind the scenes into their workspaces. Let's get into the questions and answers. Do you have a dedicated workspace? Did you invest in anything big for it? At work I have a stand up desk and lots of places where I can sit if I need to separate myself from distractions. What helps get you in to the working groove? Coffee? Music? so that’s the first device to get turned off"
What's your favorite thing in your workspace, and why? I keep examples of my own work, my friends work, and awesome antique store finds on two IKEA shelves that sit above my drafting table. What's in your dream studio space? What's one thing that you want to get in the near future to improve your workspace, and why? My dream studio space is to have two large desks, and a large work table for screen printing / miscellany art adventures. Also a lot of flat file storage for paper and supplies. I really love the old rustic industrial look, but I’m not super picky about that. Right now I'm just working on getting better at compartmentalizing all my stuff. so I can de-clutter my living space a little. Is it possible for you to work on the go? What do you need in order to get work done outside of your place? I travel a lot, so I’m working on the road quiet often . . . If I can’t take a lot of instruments, the essentials are hard pencil, paper knife, scissors, a few liners, pointed brushes, Sharpie markers, Tombow brushpens and black ink. Clearly, one size does not fit all when it comes to work spaces and habits. Everyone has their own preferences. Olga and Nev prefer to be around other people, and not stuck in the same space every day, while others like Terence and Joseph prefer a private space to focus. You don't need a beautiful space to make great work. It's easy to get caught up looking at photos of beautiful spaces, comparing them what you have (or don't have). But truthfully, many of the best creators have the most minimal of setups. It's definitely good to have goals to strive towards, but don't ever let that stop you from making great work wherever you are at right now. Work with what you have (inside or outside). I once had a professor named Peter Pracilio who told me that his first apartment was so tiny that he would literally make his paintings on his bed. (He also had an assistant that worked with him there.) I'm sure that situation was not ideal, but he still managed to use what he had. Invest in things you will enjoy using every day. What do you use every day? Is it falling apart or just not great quality to begin with? Maybe it's time to replace something that would end up saving you a headache and frustration in the long run. If it's something that will make you work faster or more efficiently, odds are the investment will pay itself off pretty soon. I plan to keep it minimal, by purchasing just a few things that are high quality and long-lasting. Here are a few of the items I am investing in for my new space. A workspace is a never-ending project. I feel like I'm at the very beginning of finding out what works for me. I have a lot of ideas for my space, but I won't know if they actually work until I try them. Much like any other design project, it's going to be an iterative process. Scott's area is looking pretty good, but mine still needs a lot of work. If you're curious, I will be sharing frequent updates on our new studio space on my newsletter. I hope this post inspires you to improve your workspace and habits. What's your setup like right now? How can you improve it for the future? I'm curious to hear your answers. Feel free to contact me if you have any other feedback or questions too! Subscribe to my Weekly Newsletter? Thank you for sending in your feedback! I reply to each and every message within a few days.